If you are making the pilgrimage to watch your footy team play at Canberra's Manuka Oval (aka UNSW Canberra Oval), here are my tips to choose the best seat to watch the game, after visiting the oval myself. With a seating capacity of under 14,000, it's only a small stadium, so no matter what seat you choose, you are never very far away from the action. 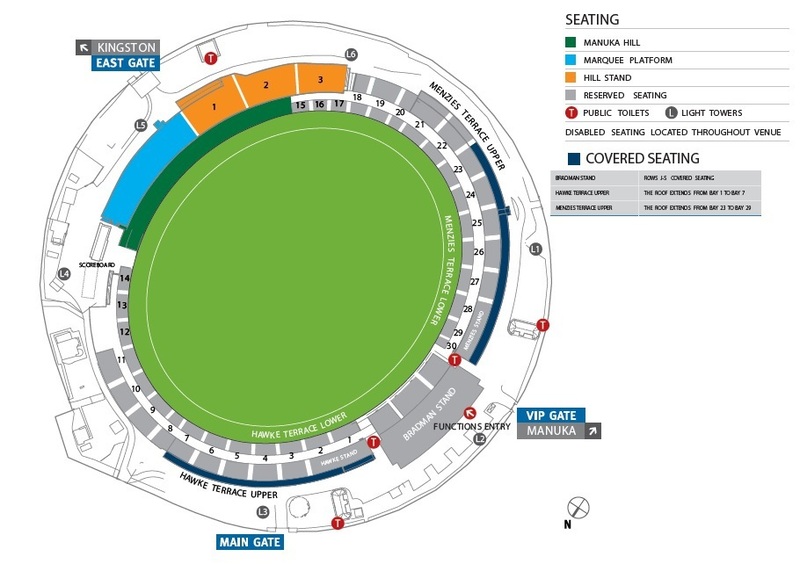 However, there are significant differences in the pricing for seats, and there is very little under cover seating, so a little bit of planning can make a big difference to your viewing experience. Before you buy your ticket, check the weather forecast. Canberra can be ridiculously cold in winter, especially for night games. If the forecast is for rain, you will want to snap up one of the few under cover seats. These are located in the back rows of the Menzies Terrace, Menzies Stand, Hawke Stand and Hawke Terrace, all of which are on the western side of the ground. The roofs of each stand or terrace don't project out very far and probably only keep you completely dry in the back few rows. Even at the back of these stands you are still very close to the game, so don't be tempted to try and book a few rows closer to the fence, as there really isn't any viewing advantage. If you are looking at the seating plan (pictured below) the seats you want are in the outermost sections of Bays 23-29 and 1-7. The price of seats in Bays 27-29 and 1-3 are roughly double what you can pay in Bays 23-26 and 4-7, without I believe any significant advantage in viewing experience, as discussed further below. The Bradman Stand itself is under cover, but the available public seating in front of it is not. 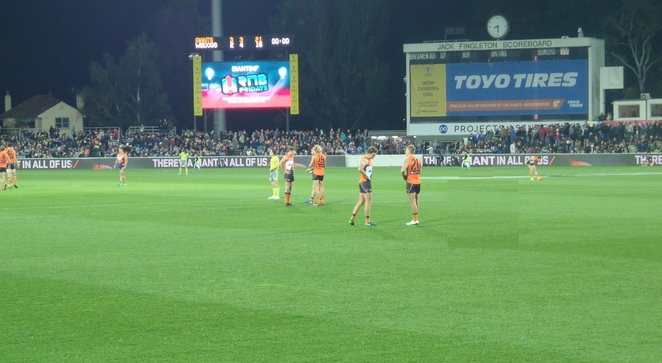 If the forecast is for fine weather, ordinarily the best seats would be on the wing, but Manuka Oval is actually one of the widest grounds in the AFL for its length. By way of comparison, it is about the same length but approximately 10 metres wider than Docklands (Etihad) Stadium in Melbourne. Therefore, at Manuka Oval, the cheaper seats behind the goals offer you more bang for buck than at other AFL venues, so if the weather is good, that's where I would sit. I wandered around to the upper terrace on the outer wing to watch for part of the game, and it didn't in my opinion provide any significantly better views, despite the slightly higher ticket price. 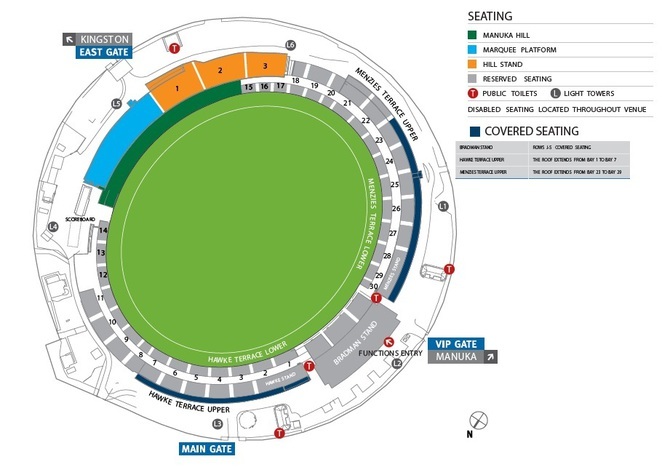 The other option available for those who are cash-strapped is the standing area on the outer wing known as "the hill". The slope on the hill is not steep, so it's probably not great for shorter people unless you are on the fence. When I visited, those on the hill were almost exclusively men, with virtually no women or kids in this area. Having said that, those watching on the hill seemed pretty comfortable and were enjoying the game. Don't be fooled by the offer of $5 tickets on the hill when booking - these are only for kids and when you view the adult price it is not dissimilar to the price of a seat. 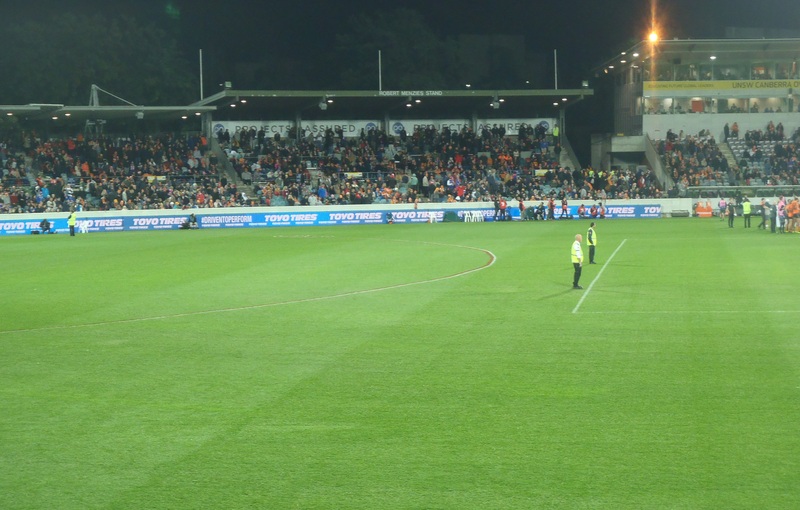 Manuka Oval has a very different feel to other AFL venues. Without a long history of AFL in Canberra, the vibe when I visited felt more like an entertainment spectacle than a sporting passion. The crowd was a lot more laid back, and when my visiting team was losing, there wasn't any of the same vitriol that you can sometimes receive at other venues. In short, there was less anger and more innocent curiosity. More happiness but less elation. 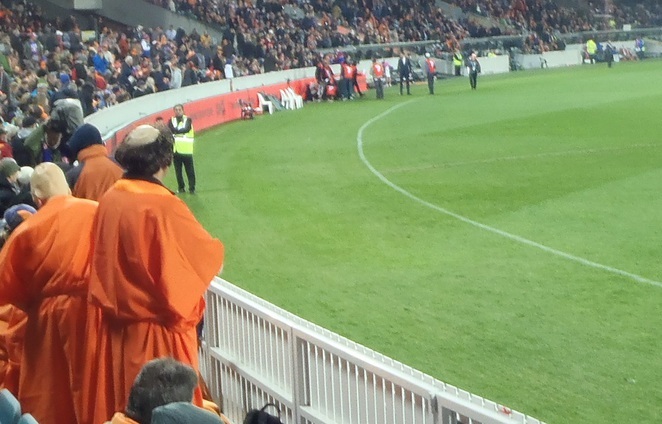 This vibe was captured best by the GWS monks, seated not far from me, who ring cowbells whenever the Giants score a goal. Their outfits contained a mix of Buddhist robes and Franciscan tonsures. For those who think monks are wise or divinely inspired, the monks I saw chose to sit in Bay 24 on the fence. For those arriving by car, the last piece of planning for the game is the parking. With fewer than 14,000 seats available, I naively thought parking would be a breeze. The parking restrictions are eased in certain areas around the venue for the game, which you can view on the Manuka Oval website. The nominated parking available at the two nearby shopping centres is very limited, so expect to use on-street parking. Finding a spot was difficult in the maze of back streets when lots of other cars were trying to do the same. If you are unfamiliar with the area, make sure you leave yourself plenty of time to find a spot and walk to the venue if you don't want to miss the first bounce. Laslty, for the record, Canberrans pronouce Manuka with a short "u", as in Manner-Car. It's not pronounced Ma-Noo-Car, despite the pronunciation of the type of honey with the same spelling.